In a large (12- inch) nonstick pan or stockpot, combine orange juice, broth, teriyaki sauce, rum, coconut cream and allspice. Bring to a simmer; cook 3 to 5 minutes. Rinse any ice glaze from frozen Alaska halbut fillets under cold water. Turn off heat and gently add halibut to liquid, skin side down. Return heat to a simmer. Once simmering, cover pan and cook 4 to 5 minutes for frozen seafood or 2 minutes for fresh/thawed fish. Turn off heat and let halibut rest 5 minutes or until seafood is opaque throughout. Reserve 1/4 cup poaching liquid. Prepare dressing by whisking orange juice, poaching broth, rice vinegar, olive oil and coconut cream. Add salt and pepper to taste. Toss salad greens, mandarin oranges and pineapple with 3/4 cup dressing. Arrange 2 cups salad greens on a plate. Top with a halibut fillet. Garnish with avocado slices and nuts; drizzle on an additional 1 tablespoon dressing. 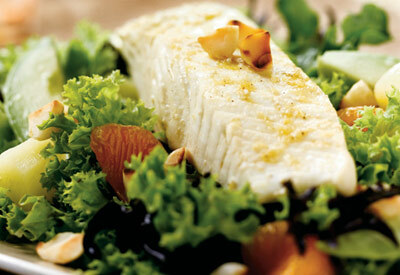 Substitute Alaska Cod, Pollock or Sole for the Alaska Halibut. Adjust cook time for fillet size if necessary.